Spouse Parents: Thomas Bzdok "Bedok"
Arrived in Philadelphia on 5-19-1882 on ship "S.S. British Crown". "Peter C. Skroch, a well-known business man of Independence, agent for the G. Heileman Brewing Company, of La Crosse, was born in German Poland, Aug. 12, 1864, a son of John and Mary (Sobota)<sic> Skroch. The father, John Skroch, a native of German Poland, came to the United States in 1882 and, settling in Trempleau County, Wis., bought a farm in Lincoln Township, where he resided until 1900 when he retired to Independence.. He died Jan 14, 1916, aged 84 years. his wife Mary died Dec. 25, 1911, at the age of 63. ..."
Mary Sabotta is the sister of Agnes Sabotta. Agnes is the wife of Frank Skroch bother of John Skroch. Arrived in Philadelphia on 5-19-1882 on ship "S.S. British Crown" with John. This images courtesy of Kevin T. Skroch. From Beth Kowahl, email 17 Feb 2002: "Thank you to everyone for all your help. I just got a call from my parents; they were looking through some old photos to verify Susan's birthdate. As it turns out they have a photo of Susan and John's tombstones, and it shows her birth year as 1865, not 1866. Boy, I'm sorry for the confusion. It looks like there probably was a Mary Skroch after all! Susan died in 1951. There are no actual dates on the tombstone, though. As for the John Skroch family photo, I do believe that is Susan Skroch Kowahl. I have seen a photo of her when she was older, and it does look like the same person to me." Nine children. Three died young (1 day, 5 days, and a boy at 5 years). This information courtesy of Kelly Otto (Granddaughter of Edwin Gamroth, Great-Granddaughter of Christina Skroch and Albert Gamroth). Christina Skroch was born 1881 in Independence, WI. and died in Milwaukee, WI on June 25, 1963 she is buried at Holy Cross Cemetery (Catholic). 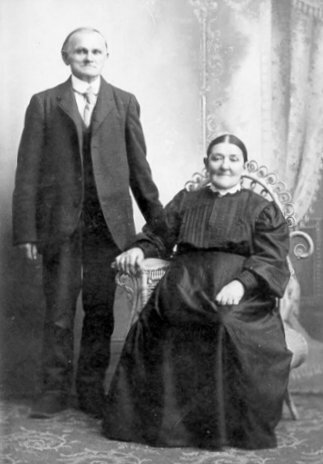 She married Albert Garmroth on 27 Oct 1903 at St Peter & Paul Church Independence, WI. Albert was born in Indenpendence, WI on November 23, 1877 and died from complications due to cardiac arrest (per death certificate) on July 13, 1967. Albert was born to Francis Gamroth and Ludowica Hagen (Peter & Louise). He is also buried at Holy Cross Cemetery. They had a total of 10 children. Married Mary Jurasovich. Rudy died on 04 May 1982, buried Wisconsin Memorial Park in Brookfield WI. They had 7 children (as listed in the obituary in the Milwaukee Journal). Married to Florence Rose then Adeline Bruss. Ralph died on May 3, 1974 and is buried at Holy Cross Cemetery in Milwaukee, WI. Children that are listed are according to the obituary in the Milwaukee Journal. When Ralph died he had 26 Grandchildren in 1974. Leona died on June 17, 2001. Buried Wisconsin Memorial Park, Brookfield, WI. She never married but had 2 children, they are as follows. Leona had 5 Grandchildren and 8 Great-Grandchildren at the time of her death. Married Frank Dirnbauer. Louise died on 29 Jan 2000. Buried Holy Cross Cemetery. Her children are as follows. 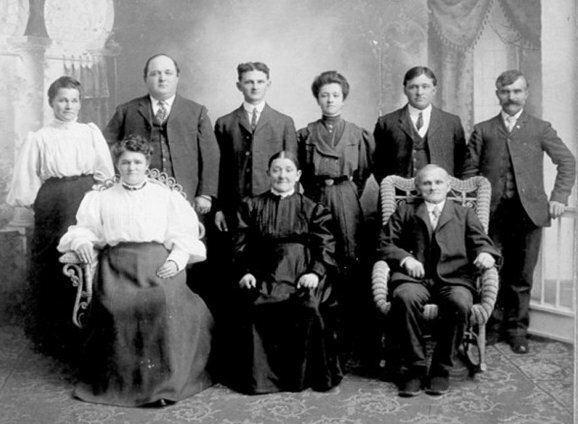 Louise had 16 Grandchildren and 23 Great-Grandchildren at the time of her death. Married Michael Pelowski. No children. She worked at Briggs and Stratton. She died 22 Oct 2003. Buried Holy Cross Cemetary. Married Delores Kieman (born November 7, 1916) on October 14, 1939 in Milwaukee WI. Delores died of complications due to strokes on June 20, 1993 and she is buried at Holy Cross Cemetery. Edwin died of lung cancer on May 26, 2000 and is also buried at Holy Cross Cemetery in Milwaukee, WI. They had 4 children together. Edwin had 7 grandchildren and 8 Great Grandchildren (or Great ones as my grandpa would call them) when he died. James, ?, currently lives in Tennessee with his 2nd wife Pat. Janice Gamroth, 21 Dec 1942. Married Arthur E. Pfeiffer, born 21 Mar 1933, on 3 Mar 1971. Arthur passed away from congestive heart failure on April 7, 2003. They had one child together. Susan Gamroth, 16 Sep 1947, married James Rommelfanger. Thomas "Tommy" Gamroth, 18 Sep 1953, married Ruth "Ruthie"
Jennifer Gamroth, Jan 1968, married Adam Blissett. Married to Joanne. Bruno died 6 Jun 1998. Buried at Wisconsin Memorial Park in Brookfield, WI. Married Dorothy Lindsey who died 24 July 2000. Cliff died on April 5, 1998 and is buried at Wisconsin Memorial Park in Brookfield WI. Married: Peter L. Marsolek on 18 Jun 1907 at St Peter & Paul Church Independence, WI.